Lonely Planet's latest book, How to Land a Jumbo Jet, includes this fascinating infographic comparing McDonald's around the world. Some things we learned: The busiest McDonald's is located in Moscow, with 40,000 daily customers, and apparently there's a ski-thru Mickey D's in Sweden. 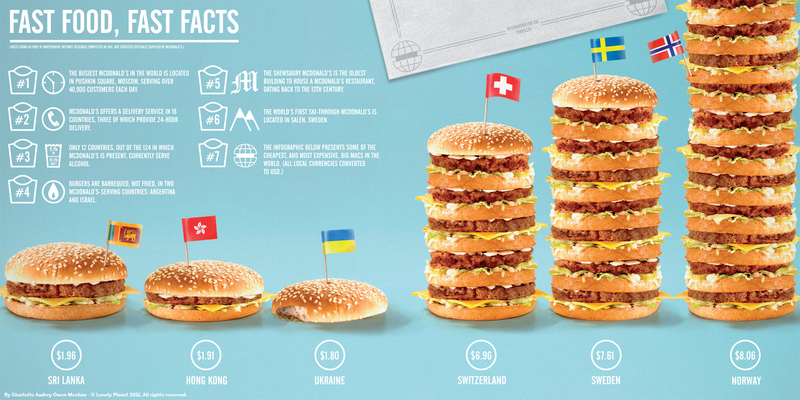 And the most expensive Big Mac in the world? Norway's Big Mac sells for $8.06. Read the infographic for more.